For Paintball in Surrey we offer a selection of prestigious venue's, the first is located in South London just off Junction 6 on M25. This paintball site is widely recognised as one of the best venues for paintball in surrey and uses the highest quality paintball equipment. 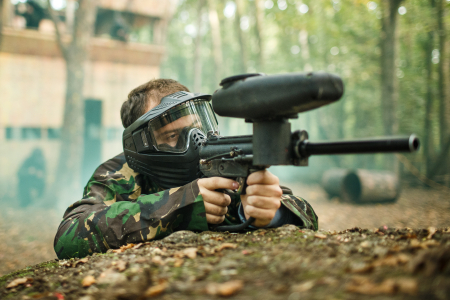 Other venues that cater for paintballing in Surrey include our Dorking and Woking paintball sites. Both venues offer a variety of paintball games and scenarios and an equally great days paintballing lies in store at either site. Use the map above to click on the desired location for full information relating to your selected paintballing park. For more details on each of the specific venues please click the links below. Salmons Lane, Whyteleafe, Surrey, CR3 0HB. Halebourne Lane, Chobham, Woking, Surrey, GU24 8SL. Henfold Lakes, Henfold Lane, Dorking, Surrey, RH5 4RW.